Looking for a Used LS 460 in your area? CarGurus has 1,687 nationwide LS 460 listings starting at $5,950. Packed with posh and ready to once again take on the German auto-making juggernauts, Lexus’ 2014 LS 460 full-size luxury sedan stands pat, tweak-wise and, more importantly, price-wise. Oh, you’ll still have to come up with a ton of cash for this heady, hushed and handsome plush-mobile, but you’ll also get a slew of perks to go along with last year’s re-designed spindle grille, reworked rear fascia and added interior bling, as well as the return of the surprisingly adept F Sport package. Then there’s the unique driver-selectable Adaptive Variable Air Suspension with Variable Gear Ratio Steering that adjusts suspension damping, steering, climate control functions and throttle response with 3 (Eco, Normal and Sport) or 5 (added Comfort and Sport+) modes, depending on the trim selected. All in all, the old adage holds true: You get what you pay for. In any case, the usual trims, the standard-size Base and the stretched-out L, both of which, as well as the available F Sport sub-trim, are offered with standard rear-wheel drive (RWD), while all remain available with full-time all-wheel drive (AWD). The Base and L offer wheelbases of 116.9 inches and 121.7 inches, respectively, with the L trim eligible for an available Executive Class Seating Package that plunks an oversized middle console, powered ottoman, cooled storage bins, added premium leather appointments and rear-seat DVD entertainment into an already roomy and high-end rear seating area. Alas, this optional opulence means seating is reduced to 4 people, including bodyguards, but once more an impressive 18 cubic feet of trunk space is standard in all trims, while the rear seats fold down for some extra toting capability when needed. Power for the princely 2014 LS 460 is again provided via a variable-valve-timed (VVT) 4.6-liter V8 engine that comes under the management of an 8-speed shiftable automatic transmission. Power numbers remain 386 hp and 367 lb-ft of torque, while mileage is again pegged at 16 mpg city/24 highway in standard rear-wheel-drive (RWD) trims and 16/23 in the available AWD editions. Once more, the optional full-time AWD works to get the most out of cornering attributes, while standing ready to switch torque from the wheels that slip to the wheels that grip when roads get slippery. The entry-level LS 460 Base trim, as well as its F Sport stablemate, offers such standard appearance goodies as 18-inch alloy wheels, heated, reverse-tilting power-adjustable outside mirrors and a power sunroof, while leather upholstery, power-adjustable front seats, leather and genuine wood cabin accents, and full power accessories again grace the inside. Of course cruise control and telescoping tilt-wheel steering are back, as is a remote garage door opener, not to mention front and rear parking sensors and a rear-view camera. Lexus’ Enform infotainment system, meanwhile, again partners with Bluetooth hands-free calling and music streaming, along with Safety Connect emergency communications and alerts, while the standard single-CD player returns with 10 speakers, a video monitor, satellite radio and a USB port. Additionally, the Enform system is bolstered by Lexus’ sometimes balky (say reviewers) Remote Touch Interface with its 12.3-inch color touchscreen display. The king-size LS 460 L, meanwhile, comes delivered with the Comfort Package that remains optional in the Base trim, and includes powered rear-window sun shades, heated and ventilated front seats, and a power-opening trunk lid. Options are again trim-dependent and come mostly in package form, including 19-inch upgraded wheels, Brembo brakes, a sport-tuned air suspension system, steering-wheel-mounted paddle shifters and unique badges and graphics in the F Sport sub-trim, with the All Weather Package offering headlight washers and wiper de-icing available lineup-wide. The Ultra Luxury Package, meanwhile, sports 4-zone climate control, power-adjustable heated and ventilated massaging rear seats, and separate rear audio controls and is also available to all trims. Various standalone options, finally, include remote engine start, the aforementioned Adaptive Variable Air Suspension system with added selectable modes, LED headlights, upgraded leather cabin accents and a Mark Levinson premium audio system with 19 speakers and 450 watts of power. Last but not least, look for such standard safety features as 4-wheel antilock brakes (ABS), traction and stability control, front and rear head airbags, front (and available rear) side-mounted airbags and active front headrests to again be carried aboard the 2014 LS 460 lineup. Of course, daytime running lights and front fog/driving lights also come standard, as do high-intensity-discharge (HID) adaptive headlights, along with an Enform-bolstered post-collision safety system and a remote antitheft alarm. Optional safety equipment, meanwhile, again includes a driver awareness monitor, advanced pre-collision avoidance system with radar-interfaced adaptive cruise control and a blind-spot monitoring system with rear cross-traffic alert. 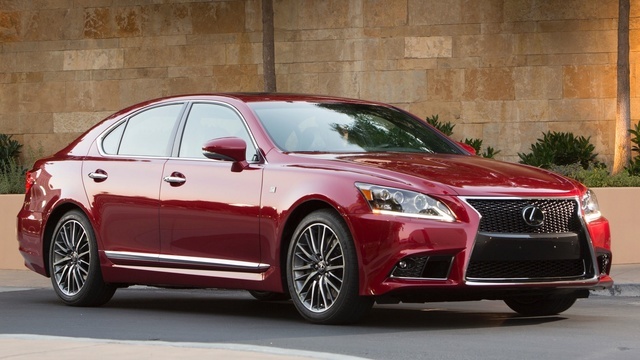 What's your take on the 2014 Lexus LS 460? Users ranked 2014 Lexus LS 460 against other cars which they drove/owned. Each ranking was based on 9 categories. Here is the summary of top rankings. 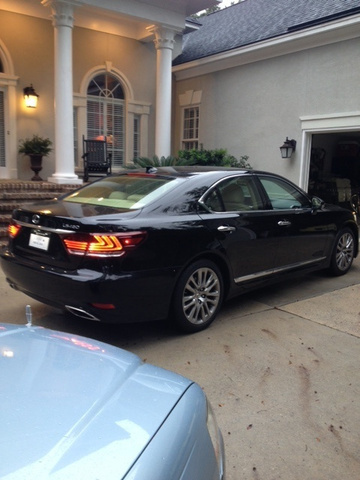 Have you driven a 2014 Lexus LS 460?